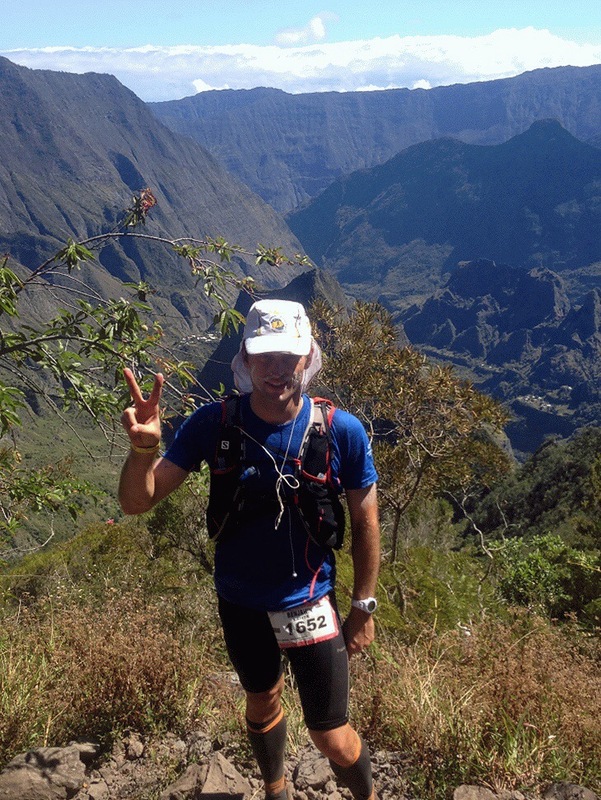 Le Grand Raid de La Reunion “La Diagonale des Fous” is certainly a crazy race. 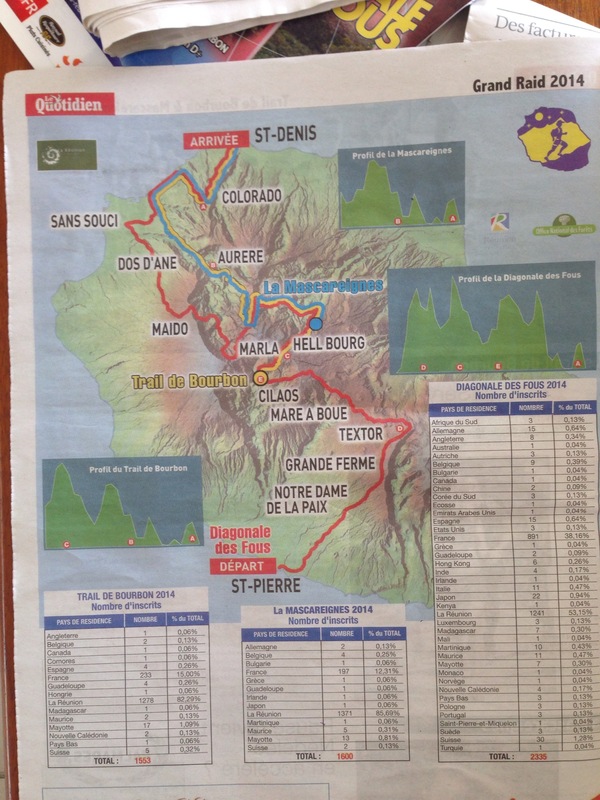 A remote island, 2500 hundred runners, and for this 2014 version, 111 miles for 33,000 ft of vertical ascent. Finishers are called survivors, and this weird nickname seemed quite logical to me when I finished the race in 2011, promising myself “never again”. And three years later here I am, joined by my friend Alex. The first time I finished in 47 hours, and with a much better training in 2014 when I had a decent number of long runs in, my target 43 hours. My last two runs were on the island, climbing Pic Adam twice, with a good feeling and a good form, I definitely was excited and eager ! The last minute news of an extra 8 miles being added to the course bothersme as I start doubting I can finish below 45 hours with this new course. We will see…. Thursday night. At St Pierre where we got our bibs the day before, we get our gear checked and feel the excitement going as the start gets closer. Always strange to know that only 50% of us will finish, given how much training and expectations runners have put into this race. And we go. We start on the main road, with so many people cheering us the atmosphere is great, passing through villages, sugar cane plantations, and even a place where all neighbors have us run under a “human tunnel” they formed. I started way back and take it easy, Alex goes much faster and after an hour or so, I lose him. First check point is a giant traffic jam, and then we start climbing… Being in the middle of the pack, some traffic jams form in front of me, but I know it is a long race and I don’t get upset. I start feeling sleepy. I have to fight against sleep. It is the first time this happens to me and I very unhappy about it, I lose my rythm and slow down. 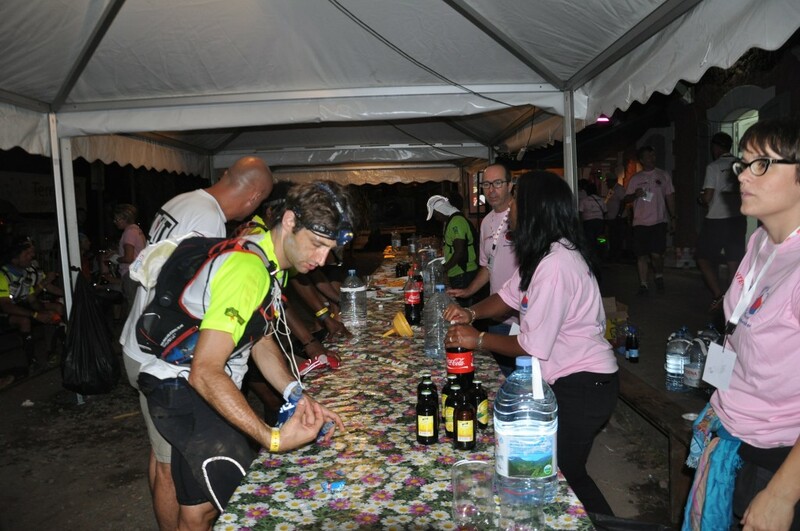 Rain starts to hit us in the middle of the night, and by the time we hit Piton Textor most runners including myself are getting very cold. I don’t wait at the top and starts going down. 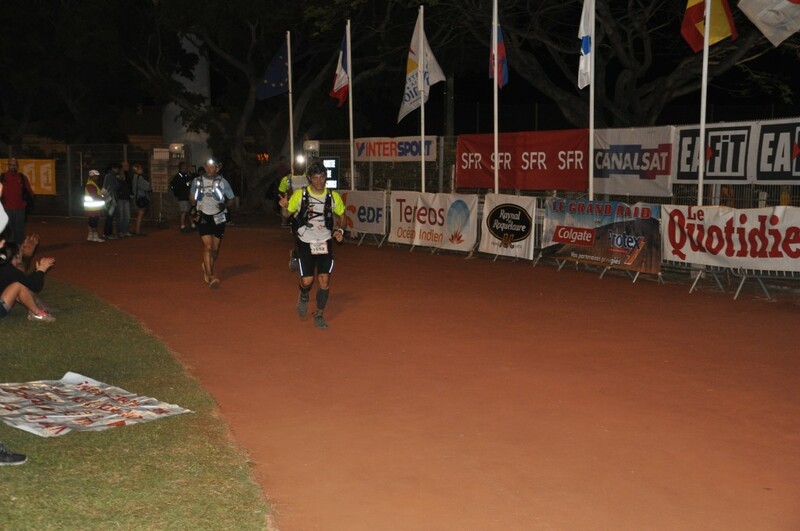 Daylight is there, and I really enjoy the section leading us to Mare a boue, allowing me to run and pass lots of runners. I get some of my mojo back. But at marre a boue it gets very cold and difficult to eat some pasta and chicken in the crowded tent. I head into the medical tent to sit down and change my socks. Well, this place is full of runners close to hypothermia, and staying there in the cold is a death trap. I leave and head out under the rain, for a long climb with lots of mud, rocks, water running down the trail. This is depressing. I go so slowly, and just put one feet in front of anither to get the top. 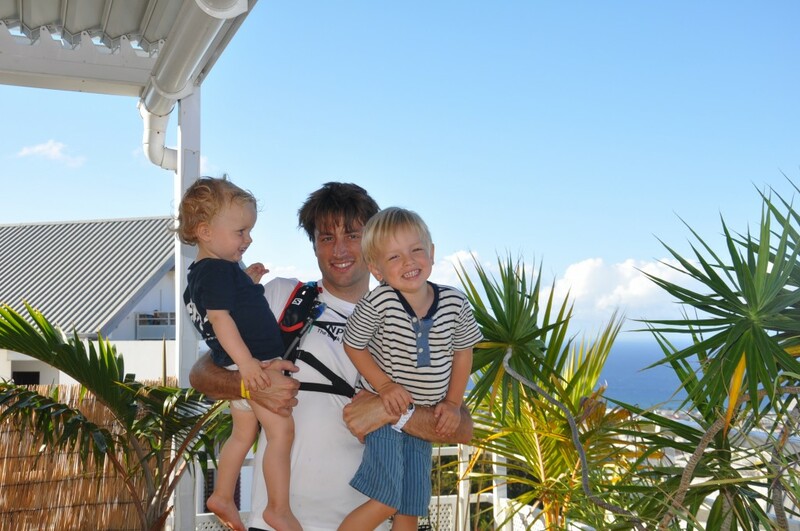 At the top, it is sunny and we have an amazing view on Cilaos. The descent is very tricky and we have to help a runner who fell into a tree canopy a couple of meters below. One meter before or after, and it would have been much worst. Once at the bottom we still have to cross a river, adding useless elevation, but I forget about this once I arrive in Cilaos. There I stop a good hour or so, eating pasta, changing shirt and socks, drying my shoes and refill my stash of gels. I get a small blister cleaned, and the nurses dry both my feet with betadine. This small mistake will be my demise… but at this time I am only a little unhappy about my time, as I know I will hit Hellbourg after sunset. The next climb called Le Bloc is terrible. It is very tough and I challenge myself to climb it non stop. I arrive at Refuse Piton des neiges were they have ran out of everything. I am upset as I really wanted something, anything, but I also realise it means I am ranking much worse than last time. 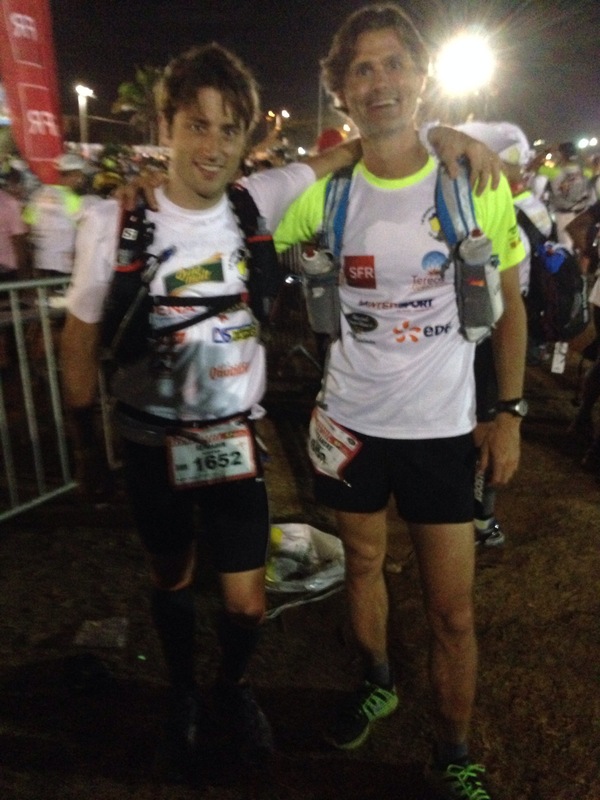 The first 45mn down are very rocky, a terrain I hate, and I lose the mojo I had at Cilaos. Tough. Before starting the climb down to hellbourg, at the top of cap anglais, at the moment the sun sets, I have an amazing view on the island. It motivates me to run for the next 15 minutes until I have to light up my headlight, for a very muddy section with ladders, where my pace decreases drastically as it is very difficult to see where you are running. The last downhill section to reach Hellbourg is runnable and I am finding energy to get back into a good rythm, exciting to meet with Cecile and Alain at the Hellbourg aid station where i get pampered with soup and pasta. It feels so good. I run out of feet cream, decide to change socks, and attack one very long uphill section in the dark. I can’t believe this is only km90 but off I go in the dark for a second night. People tell us that the weather will now be more friendly going forward and I believe them… for an hour or so, until I hit the bottom of the longest climb of the race and the rain hits. And what a climb ! After two hours in the dark, with no light or sign of an aid station above us, the group I am climbing with starts doubting we are on the right trail. Checking the altitude, i am quite sure we are just one hour away, but the total absence of natural light makes it very difficult to have any sort of reference to assess our speed and distance to the top. But like all bad things, we finally hit the aid station, and shortly after the Col des Fourches that will lead us to Mafate. 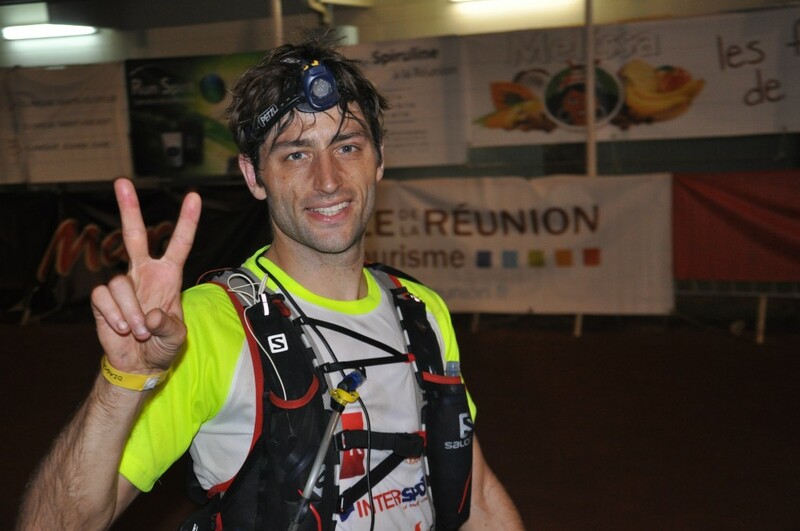 I am glad to reach Magate as it is the most beautifuk section of the race. My initial plan was to reach Roche Plate before sunset, which bring me back to the reality of how slow I am, but I start the rocky downhill section diwn to Marla. I struggle in this rocks and my feet start to hurt a lot, my eyes want to close and I can’t the the aid station lights. I decide to try to nap for 10mn but can’t find a dry spot. I finally find a group and jog 10mn witgh them, but soon am unable to as my feet hurt too much. I walked to Marla, really an oasis in a beautiful setting. I stop in Marla for 45mn, getting excellent food, and my feet bandaged with lubricating cream. My feet get super dry and start to crack, not much to do except to hydrate them a lot. Exactly when i leave Marla, the sun rises, and I catch fast guys running well, and follow them for an hour of delight, running near the bed of the river, not too hot, repaired and well nourished. I love it. Reminds me why I am here. We cross the river, I remember that last time I did this race it was 3am at this point. Now it is 8am. Tough mentally. I keep going, despite the rising temperatuees, and reach Roche Plate, where I have a lot of fun chatting with the volunteers and getting my bandages redone. I get plenty of water for the steepest climb of the race, under the sun, and attack it with a good rythm, enjoying the magnificient views as I rise above the bottom of the cirque. Great climb, tough but honest, and I pass several trailers along the way, however it is so hot that I have to be careful not to use all my water. I impose myself a 5 minute minimum between sips, But when I see all the supporters gathered at the end of the trail where it reaches the plateau, I feel energized and keep pushing. One competitor being me tells me I am zigzagging dangerously close to the edge and should get some sleep, but I don’t believe him. At the top I pass a trailer who needs a wood stick to walk, the medics will later force him to abandon with only 40km to go. He has a broken meniscus. 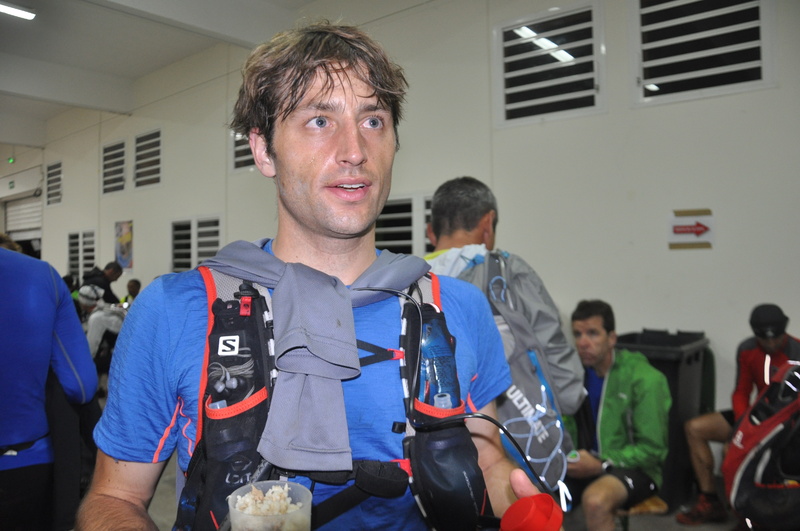 At the aid station at the top, atmosphere is great and I get my bandages cleaned again, while eating and drinking and feeling well. So next section is very runnable, along the crest of the circus, and the view is breathtaking. However I start to have hallucinations from not sleeping. It is the first time it happens to me. Trees become tigers, branches become kids cheering me, rocks are forming sentences. After an hour i cannot take it anymore and sleep in a ditch for 10mn. Wahoo. It revives me. That’s perfect. We are supposed to reach a checkpoint that actually doesn’t exist, which drives me crazy until I understand I passed it. Two kids on the trail gives us some candies, and promise me thenext aid station is close. As everybody always does. But suddently we get hit by a massive storm, and quickly are again under the rain and wet, with horrible red mud making the shoes super heavy. 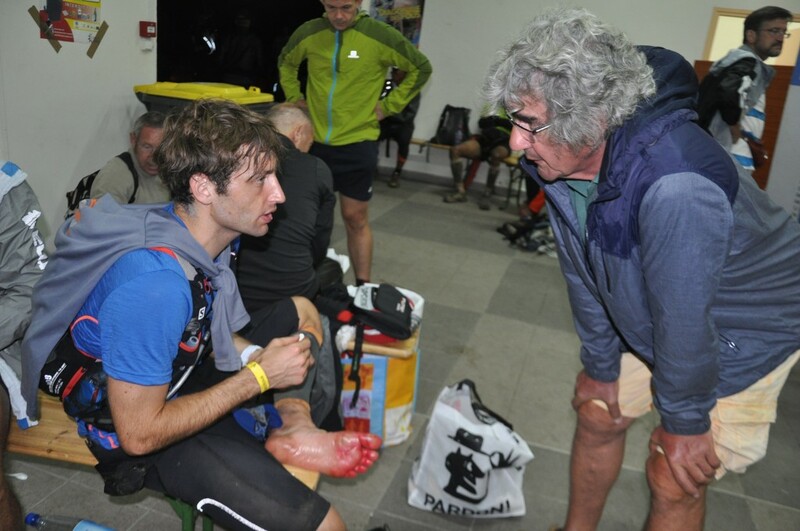 A nice surprise is waiting for me at the next aid station where two old friends are here to cheer me in the rain, and there are nutella crepes… The rain stops and under the sun we cross a burnt forest, before reaching our drop bags where I have dry shoes. I have my bandages redone for the last time, change shirt (mmhhh) and find a swiss trailer with whom I am going to spend the next 10 hours. After an easy climb, we reach a section I remember very well where wr have to use out hands to climb through trees and branches, almost rockclimbing at times. 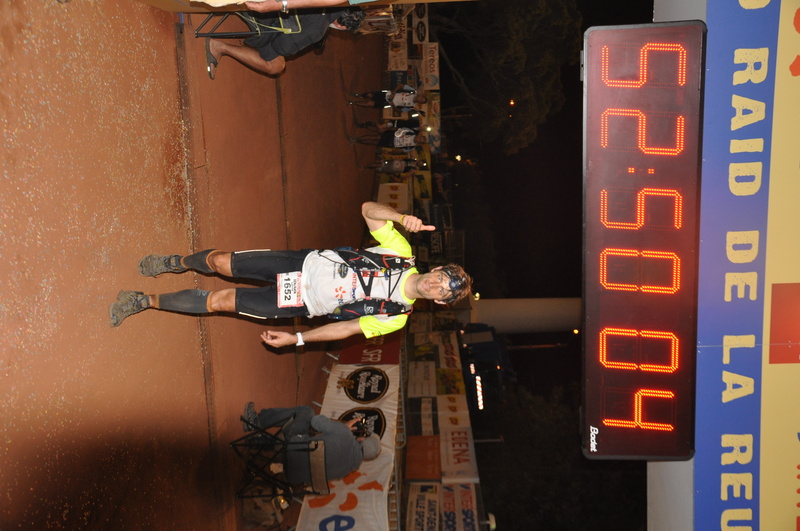 Then a long downhill run wiyh the headlight… Good rythm and I get passed by lots of trailers doing the half distance race. They look so fresh… I hit the shore and feel good. A plate of pasta gets me going again… until I hit the Chemin des Anglais, an old trail paved with awkward pointed rocks that tears through your shoes. With my feet in bad shape, I suffer immensly. I had forgotten how sadistic this section is. I hit a low. I want to cry. I don’t know where to walk. It never seems to end. And then I see the lights of the aid station. And Cecile and Alain. It is 12am. Almost there. It is so late. My feet are destroyed. But I had totally forgotten that this Chemin des Anglais was continuing for 2km or so before we would hit a regular road. Oh my god. I almost cry. I cannot take it anymore. Once I reach the next village, when we intersect the main road, i starting cracking up. I sit down and collapse. I ask the volunteer managing the traffic for his only bottle of coke. He takes pity and give it to me. I could stay here for hours. I get up and cross the village, and then we hit a stupidly steep trail, and at each turn I have hallucinations where I see an aid station that looks like a medieval banquet. A local tells me it is 5 mn walk to the aid station, but I don’t believe anybody anymore. But 3 runners I pass tell me the same, so I start to believe. It is true. 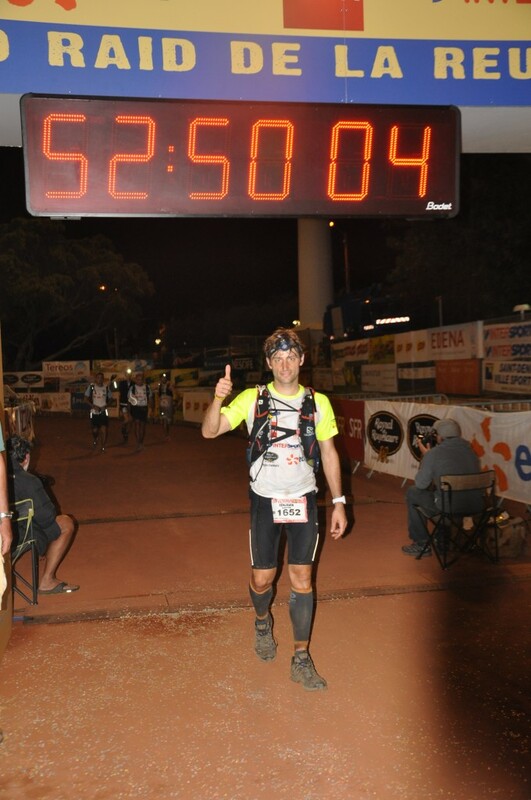 I love everybody at the aid station, happiness fill me, just 4km downhill and I will be done. I eat as much saucisson and drink as much coke as I can, and I leave. This is one of th most dangerous descent but I don’t care., at some point I slip and get a nasty cut but move on. One hour later isee the lights. I run along the road for 3 minutes and see Cecile and Alain there. It is real. It is finished. I am a finisher, despite everything, thanks to everything. The next couple of hours are surreal, I am carried home, in the shower, despite the tropical temperature that would require air conditioning, I sleep with blankets, feel horrible, and wake up with both feet so infected that an female ER doctor will later tell me “when I am going to remove the skin of your feet to inject disinfectant directly into it, it is going to hurt like when your wife gave birth…” But despite all this, yes, it was worth it.